Wash Your Clothes With Magnets? Washing your clothes with magnets instead of laundry detergent seems crazy. So we decided to give it a try, and the results are astounding! 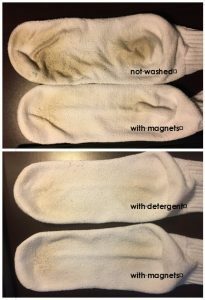 There’s virtually no difference between the sock washed in detergent and the one washed with the magnets. If anything, the one with the magnets is somewhat cleaner! Apparently the concept of detergent is that it greatly reduces the surface tension of water so that it can get between the particles of the fabric and clean away dirt. And strong magnets do the same thing! Interestingly, you can even skip the rinse cycle because there isn’t anything added to the water that needs to be rinsed away! For the first time, I was dealing with agents who put my interests ahead of their pocket book.